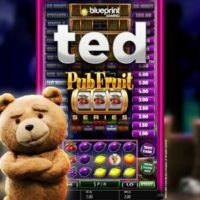 Blueprint Gaming’s latest addition to its fast-expanding Pub Fruit Series sees the return of the mischievous talking teddy bear, tedTM. Following the hugely successful slot game inspired by the Hollywood film franchise, the gameplay has been transformed into the style of the popular fruit machine format, with players following the cuddly hero as he aims to climb the prize ladder. The 5×3 slot features traditional AWP machine features and 16 bonus games, including two feature boards and the Super Shot Zone, where users can multiply the cash pot value. Those lucky enough to reach Ted’s Big Money round have the chance to win up to 1000x the bet. Under licence from MRC II Distribution Company, the game is available in full portrait mode and incorporates responsive functionality to give users the full fruit machine experience. It is the latest title to join Blueprint’s Pub Fruit Series following the release of Deal or No Deal – The Perfect Play. The gameplay draws upon Blueprint’s rich heritage in the land-based market, creating an exciting new online gaming experience. Jo Purvis, Director of Marketing and Relationships at Blueprint Gaming, said: “We’re thrilled to be reunited with our favourite thunder buddy and deliver another exciting new addition to our Pub Fruit Series.